Docker and Jenkins are like the chocolate and peanut butter of the DevOps world. The combination of the two present a ton of new opportunities and headaches. I’m going to talk about both. For this post, I’m assuming you are already familiar with setting up Jenkins and comfortable with Docker. Rather than rehash a lot of existing posts on Jenkins and Docker, I would suggest heading on over to the Riot Games Engineering blog where they have a ton of excellent articles on integrating Docker and Jenkins. I’m going to focus on my specific set up, but I’ve borrowed a lot of ideas from them. I say “target” because all of the pieces to don’t yet do what I’d like them to do. 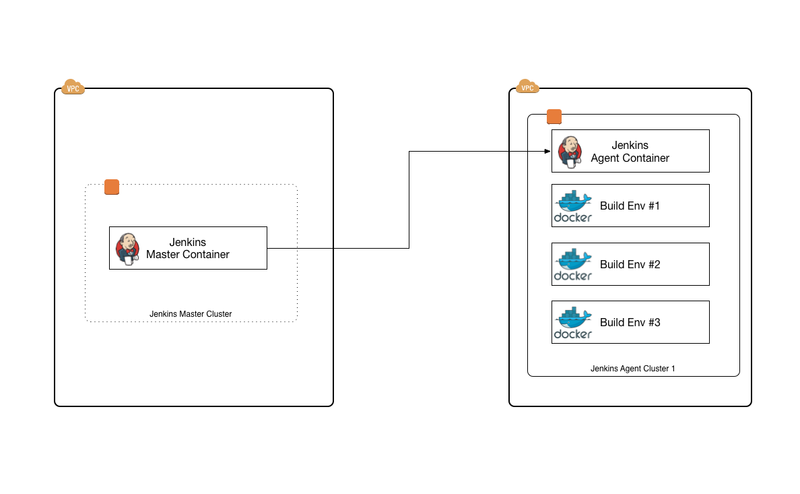 It’s simple really: set up a Jenkins master in a container on one host with multiple JNLP agent containers across multiple hosts. The agent hosts could run in different AWS VPCs and/or accounts using ECS. My goal here was to have a generic agent configuration that could be deployed onto any host. Each project would then be responsible for for defining its own build environment and that is expressed through a container. This would put the build environment configuration in hands of the development team rather than the team that is managing the Jenkins infrastructure. I REALLY wanted to avoid having agents with a specific set of build tools. Containerized build environments can do this, it’s just getting everything to play nice that is the real challenge. This pipeline will execute the build on a Jenkins agent named “test-agent” and will attempt run the build inside a container based on the “maven”3.3.3-jdk-8” image. This particular pipeline runs fine when the agent runs directly on the host, but it fails when the Jenkins agent runs in a container. By having either the Jenkins master or slave in a container, one might assume that I’d need to run the container in privileged mode and doing the whole “Docker-in-Docker” thing. I’m not. Jérôme Petazzoni published very informative post titled “Using Docker-in-Docker for your CI or testing environment? Think twice.” You should read it. The rest of this post assumes that you did. This will bring up Jenkins and it will be able to call the docker command and do everything a “Docker-in-Docker” set can do. There’s no need for privileged mode or the wrapdocker script. One caveat here: you’re not going to be able to simply reuse the official Jenkins image to do this because the jenkins user needs to be a part of the docker and/or users group in order to be able to make use of the socket. Once you do that, Jenkins can happily call docker from within the container, and you can build and run other containers with ease. Like the Jenkins master, you have to ensure that the jenkins user is in a group that has the privileges to access the docker socket. I’m using a fork of the Jenkins JNLP slave container and adding the necessary groups. Once you do this, your agent will come up and you’ll be able to execute builds against the agent. Almost. Since we’re kind of running “docker-in-docker”, getting the path of host directory is tricky. It’s not exactly portable since the containers need to have more intimate knowledge of the hosts directory structure. Volumes created with docker volume create will always be owned by root. This is being fixed for Docker 1.11, but it doesn’t help much when you’re using docker 1.9 and 1.10. Since Jenkins runs as jenkins, this doesn’t work. So far so good. 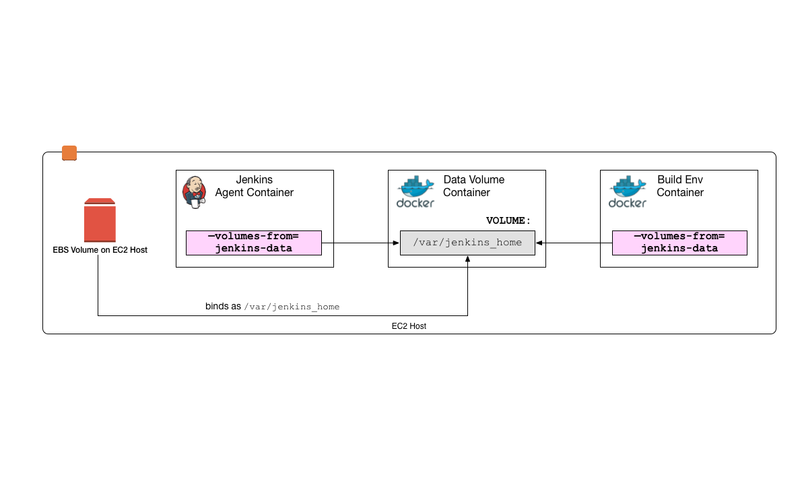 The bad news is that the Docker Pipeline plugin still insists on mounting a volume from the host, which in my case doesn’t actually exist in the Jenkins agent container. So for now, the Cloudbees Docker Pipeline plugin is a non-starter. And this mostly works. The project will build but fails on the tests because the pipeline git task doesn’t handle submodules very well. However, this is an issue with the specific project and we at least have the build failing 2/3’s the way through the build in the target containerized build enviornment.